This entry was posted in Uncategorized and tagged Christie, Financial Meltdown, New Jersey by Kirk Petersen. Bookmark the permalink. "The proposal by Christie: No job cuts in the education sector if teachers contribute 1 and 1/2 percent of their salary to pay for benefits (approx. $750. per year) and have a one-year pay freeze. If not, approximately 1300 jobs will be cut." Kirk, the statement above is, unfortunately, incorrect. In the Bergen County district where I work, we did give back 1.5% on benefits and received a 1% pay increase, not the 4-5% the governor likes to say teachers have received across the state. Were teachers to agree to give back the 1% pay increase, the state would reinstate $74,000 of the $1.1 million aid reduction. There would still indeed be substantial teacher layoffs. 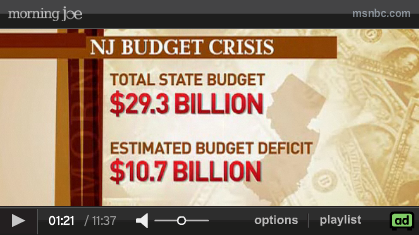 More if, as Christie has urged every voter in New Jersey, the budget is defeated at the polls on Tuesday. I'm afraid folks like what Christie is saying because he offers easy answers – along with serious misrepresentations of fact – to extremely complex problems. I still think the governor is on pretty firm ground, however, regarding the need to take drastic action. If the deficit totals more than a third of the budget, there are going to have to be a lot of cuts in a lot of areas. New Jersey sounds a whole lot like Michigan. I expect Michigan will elect its own Chris Christie this November. It just goes to show that Politicians are always gonna piss some one off. Will it be you or the Unions? He at least knows he can't be all things to all people. Myself I think it's a good idea for states to offer a tax incentive for sending kids to Private Schools. It would take a lot of weight off the state budgets. New Jersey a failed experiment? Ha! Try California. We are in the hole $20 billion right now with no real way of fixing the problem.